L&B Spumoni Gardens | I dream of having one hollow leg. Ah, summer. I find it easy to wax nostalgic on it weeks and weeks after it has left because of New York’s long fall. It never seems like it was that long ago, and then you look at the calendar and see words like “November.” Not the time for leisurely meals outside. 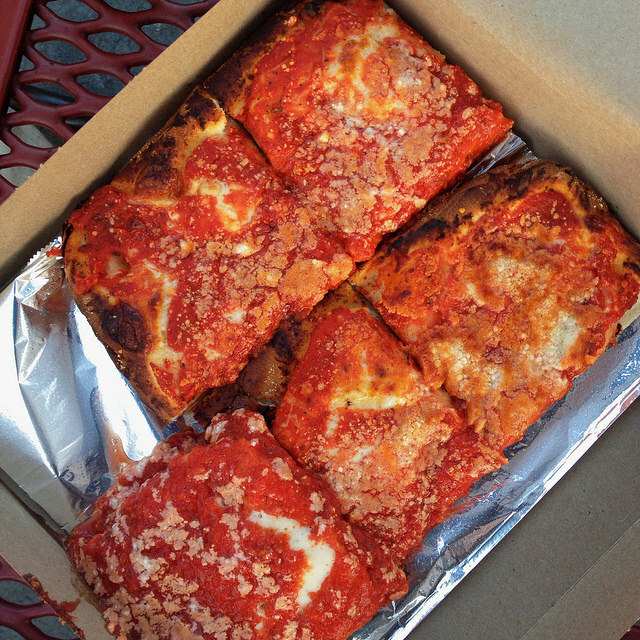 But when the weather is pleasant, L&B Spumoni Gardens is one the best places to take advantage of that time. And there are few better meals than those that contain pizza. L&B specializes in the square slice, which some call a grandma slice or Sicilian-style. Read this article for more information or confusion. All you really need to know about L&B’s pizza is that it’s rectangular, cooked in a pan, has mozzarella under instead of on top of the tomato sauce, and that the crust is very focaccia-like. Also, it’s delicious. It is of no use to analyze the crust, cheese, or sauce to figure out why you love it so. Harmony is achieved, and it is elevated above its ordinary ingredients. Eating two to three pieces is an easy feat. I once did four. Because, despite the looks of a slice, it’s rather light. Visiting hungry is essential for understanding the benefits to trying the different types of slices that come from each whole pie. Corners have two edges of crust, an edge has just one, and a middle, none. I like being able to have all three. A corner is an obvious favourite for the textural contrast between crunchy and soft, easy handling, and rarity (only four per pie). An edge is the most standard experience and keeps your fingers clean. A middle piece is definitely the overlooked child of the bunch. No handle, no crunch, but you do get an uninterrupted bounty of that soft cheese-sauce-dough combination, which could be considered the heart of the pizza. L&B is a proper Italian restaurant with pasta, salads, appetizers, etcetera, where you can sit inside and order wine and eat with proper utensils. It is one subway stop away from Coney Island, so it takes at least 45-60 minutes to get to from Manhattan. There are certainly other places that make a strong square slice and are easier to get to. So why go? Beyond the cheap ($2.50/slice) and satisfying pizza, eating in a far-flung Brooklyn neighbourhood is fantastic. I’m quickly reminded how diverse the scenery and people of this city are when I go. You feel like you could be in some suburb with the proper houses, more ample personal space, and unrushed vibe. Most of the other patrons probably internally (or obviously) eyeroll at a city interloper like me for taking a photo of my pizza adventure rather than just enjoying what is their normal summer routine after the little one’s soccer practice. But then you realize, no, your feet are firmly planted in New York City. Remember, long train rides are perfect for reading and catch-up sessions with your friends. I won’t say to also visit for the namesake spumoni (it’s nothing special), but it would be a crime not to finish your meal without a frozen sweet treat. There is always room. This entry was posted in Eating Out: NYC on October 29, 2014 by historicalartfox.